American University President Sylvia M. Burwell announced today she has appointed Traevena Byrd as vice president and general counsel, effective April 9, 2018. Ms. Byrd comes to AU from Towson University where she is the vice president for legal affairs & human resources and general counsel. At AU, Byrd will serve as a member of the president's cabinet and chief legal advisor to the university's executive officers and board. In the role of general counsel, she will provide, manage, and coordinate all legal services for the university. "I am thrilled that Traevena is joining AU as our next general counsel," President Burwell said. 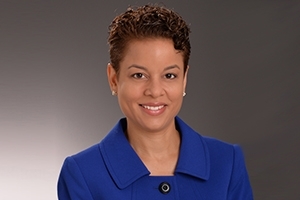 "With her deep experience advising universities, her impressive record of working with students, faculty, and staff, and her nationally recognized expertise on many of the most important issues facing higher education today, Traevena will be an excellent leader of our legal department and an important member of the AU leadership team." Byrd's career in higher education began at the University of Iowa, where she served as an assistant director of admissions, and was followed by her appointment as the director of the Commission on the Status of African-Americans for the State of Iowa Department of Human Rights. She previously worked as associate general counsel at Ithaca College in Ithaca, New York, where she regularly taught a civil rights seminar as an adjunct faculty member. As Towson's chief legal officer, she currently manages the university's legal affairs, serves as legal advisor to the president and university executive officers, and acts as the liaison to the Maryland Office of the Attorney General. "I am delighted to join the AU community and I look forward to contributing to its mission of public service and global leadership," Byrd said. "President Burwell's leadership inspires me, and I am honored to have the opportunity to be a part of the exciting and meaningful change that will positively shape AU for years to come." Byrd received both her B.A. and J.D. from the University of Iowa. She is a past member of the board of directors for the National Association of College and University Attorneys (NACUA) and currently serves on the accreditation commission for the International Association of Campus Law Enforcement Administrators (IACLEA). She is a frequent presenter on the subject of free expression on campuses, and currently serves as a member of the steering committee for the American Council on Education's Campus Inclusion and Free Expression Project and as the chair of NACUA's 2018 conference on Free Speech and Campus Unrest. Byrd is also a frequent presenter for a variety of higher education associations, including NACUA, American Council on Education (ACE), National Association of College and University Business Officers (NACUBO), and Student Affairs Administrators in Higher Education (NASPA). The search was conducted by Deborah Ben-Canaan and Michael Sachs from Major, Lindsey & Africa, the legal executive search firm.